If there are two concepts that don’t seem to belong together in any way, it’s umbrellas and solar chargers. In reality, you can only need one of those things at a time. 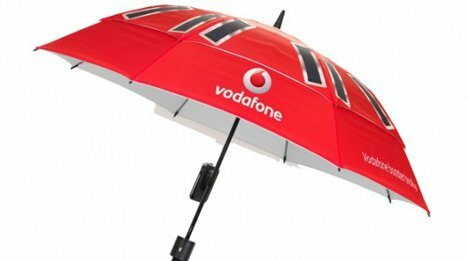 But British telecom company Vodafone is, for some reason, putting these two together in a gadget they call the Booster Brolly. The umbrella essentially has three functions: to protect you from rain (or, presumably, the sun), to provide solar charging cells for your phone, and to boost cellular phone signals. The high-gain antenna is hidden inside the handle of the umbrella, providing an increase in signal for not only the person holding the umbrella but everyone in the immediate area as well. The flexible solar panels on the umbrella’s canopy can connect to your phone or other gadget via a USB plug at the end of the handle…if the sun is out, that is. And since the Booster Brolly is being debuted in England, there doesn’t seem to be a great chance of it seeing very much sun.